Hi Friends: There is a new challenge today over at the Crafting When We Can Challenges Blog, where the current theme is Black and White with a Splash of Color. Please visit our fabulous sponsor this week, StarStampz, to see all of their wonderful products! My creation for this week is a card using this adorable Fireflies image. And, of course, my accent color is yellow because of the firefly glow. It's a little hard to see in the photo, but there's lots of glimmer on the fireflies, and a few sequins for a bit more shine. Print the image onto smooth white cardstock and color with Spectrum Noir Markers. Cut image out with Scallop Circle die. Add glitter brush pen and sequins to panel. Cut patterned papers to fit A7 card base. 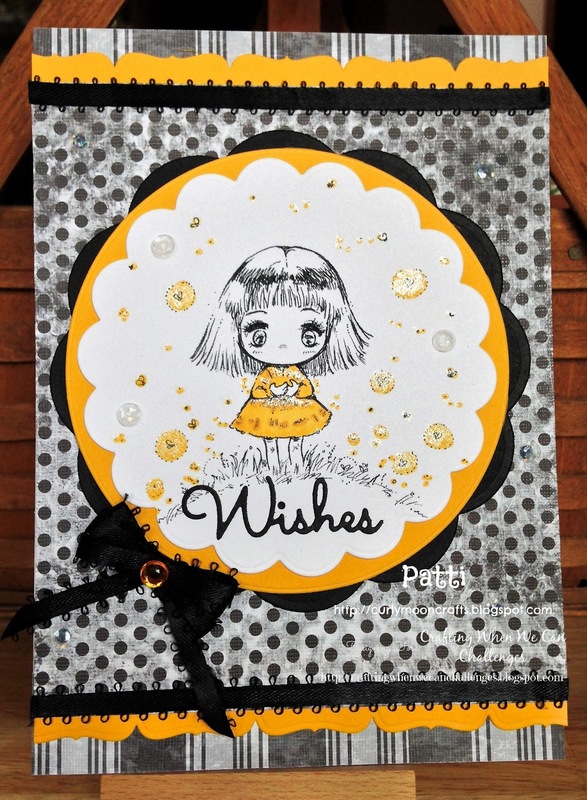 Use border die to cut top and bottom border strips from yellow cardstock. Assemble card base. Cut larger scallop panel from black cardstock and glue to center of card. Cut circle from yellow cardstock and mat behind the focal panel, then add to black panel using foam squares. Add black ribbon on seams of card base, then make a bow and add to card. Add yellow gem to center of bow, then finish with a sprinkling of sequins on the base panel.